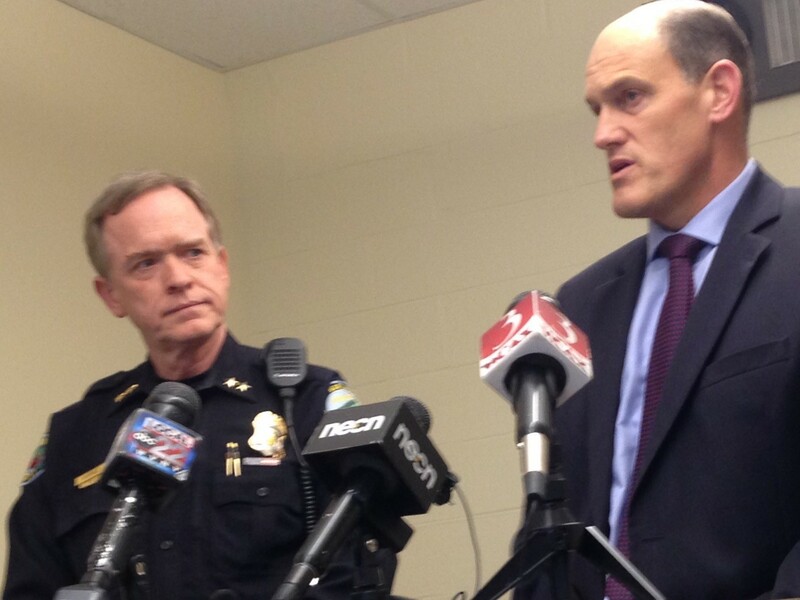 South Burlington Police Chief Trevor Whipple (left) and South Burlington Schools Superintendent David Young at Friday's press conference. Police arrested 18-year-old Josiah Leach, a South Burlington High School student, on Friday in relation to death threats made against staff and other students in the district. South Burlington Police Chief Trevor Whipple announced the arrest on federal charges at a press conference from the police department shortly after 9 p.m. Authorities had made the arrest just half an hour earlier, he said. School had been canceled Friday after threats were sent Tuesday, Wednesday and Thursday. The school day ended in lockdowns on Wednesday and Thursday. Leach, according to police, will be held in custody over the weekend until he's arraigned Monday in federal court. Someone threatened South Burlington students and school district staff in a video Friday that included the same "murder list" which prompted a lockdown and school evacuation Thursday. Superintendent of Schools David Young — along with South Burlington Police Chief Trevor Whipple — confirmed at a 3 p.m. news conference that officials are aware of the video, which had been circulating on social media. The video threatens specific school staff and students as retribution for the school board's decision to drop the Rebels team nickname. The name change has riled up the community. Critics say the name is racist while its defenders consider it a harmless tradition. Young explained that the latest threat came in around 4 a.m. Friday and "was a video and essentially repeated a lot of the same information that was shared within the text that was sent previously. The police are continuing very, very aggressive investigation at this time." No one has been arrested in the case, which prompted school lockdowns Wednesday and Thursday. School officials, concerned about safety, chose to cancel school districtwide on Friday, the eve of the school's week-long spring break. The threats are taking a toll on the community and the people on the list, said South Burlington Police Chief Trevor Whipple. He met with the family of one person named on the list and said it was "heart-wrenching." "This is a family that's afraid to leave their home," Whipple said. "Afraid of, you know, every person that walks by the house, every car that drives by." He was tight-lipped about any leads and would not comment on how the person, or people, making the threats allegedly hacked into school email accounts. The video made the rounds on social media on Friday, even as officials discouraged community members from sharing it. The 55-second clip portrays a young man standing in a room with his face blurred out and shows on screen the email threat issued Thursday. The person who made the video appeared to use a "text to speech" software program to create the audio. The computer-generated voice threatens to kill five teachers and administrators and 11 students, some of whom have worked to get the district to drop the Rebel moniker. "Good, you all finally take this seriously," the voice in the video says. "You all played well. You reached level four of my little Rebel game. You think blurring the names of the students and teachers I want to kill will help? This could have been prevented by keeping the Rebel name. Now I'm going to have to attack you all. I don't care for my own life as long as you're all dead." The video prompted widespread discussion online. Some suggested that the video footage did not show the real person behind the threat, but was video of a random person pulled off the internet. Whipple declined to answer any questions about the authenticity of the video or details on the investigation. He did say that two Federal Bureau of Investigation agents who specialize in cybersecurity are assisting the police department. The federal government has more resources than a local police department, the chief said, including agents who concentrate solely on computer crime. "That brings a level of expertise that we frankly just can't get to here," Whipple said. It can be challenging to trace messages and video sent over the internet, according to experts. "It's easy to hide behind a computer screen," said Duane Dunston, assistant professor of cybersecurity at Champlain College. People who want to stay anonymous can use free software programs to send electronic data through multiple portals, creating a winding, twisty digital trail that can be difficult to trace, he said. It's particularly difficult for American law enforcement if the email servers are in foreign countries that might not heed U.S. law enforcement demands, Dunston said. But sometimes, especially with repeat cyber crimes, the person behind them makes a bungle or reveals something incriminating, Dunston said, "something so specific that only a few people would know and help narrow who could possibly send a message like that." During the lockdowns on Wednesday and especially Thursday, students were asked to follow strict protocols, according to parents who spoke to Seven Days. Students huddled in the corners of their classrooms with the doors locked and the shades drawn in an effort to make it more difficult for a potential shooter to see in. The students on the list were escorted out of the building. The rest of the students were kept inside, and not allowed to leave, even to use the bathroom. Instead, classrooms were outfitted with plastic buckets and toilet paper; students used the bucket to relieve themselves, according to parents. "The biggest trauma they had to deal with was going to the bathroom," said one mom who asked not to be identified because of the ongoing school threats. "That was a big deal for them ... It's embarrassing." School officials told parents both Wednesday and Thursday that they could gather at a conference room across the street from South Burlington High School to get updates during the lockdowns. The first day, about 20 parents attended; the next, about 40 showed up, according to a high school parent who went both days. Many parents were texting their children still inside the building. On Thursday, the mood was fearful. The kids treated Wednesday's lockdown like a fire drill, the woman said. But Thursday "was pure terror" for them, she said. "No one was talking, they were told to be quiet, they were told there was danger." With no concrete details, false rumors flew, she said. "The kids believed that the shooter was two minutes away, so they were terrified." It's hard to know who might be responsible, one of the moms said. "It's just a scary thing ... You hope for the best and that it's just a warning sign for attention … Hopefully they will catch the person or people today."